In the first article of the series on SQL Server 2019 and Ubuntu, we prepared the virtual machine environment and installed Ubuntu 18.10 in it. In this part of the article, we will install the latest SQL Server 2019 Preview CTP 2.1. We can install SQL Server on Ubuntu by two methods. In this article, we will install SQL Server 2019 using the Docker container. Docker is basically an application package which contains all dependencies in the package itself. We can just call the Docker container and provide the configuration parameter to start using the application. Before we install SQL Server 2019 on the virtual machine let us do a few checks and necessary pre-requisites. Launch the virtual machine if it is not already running using the ID and password we configured during installation wizard. 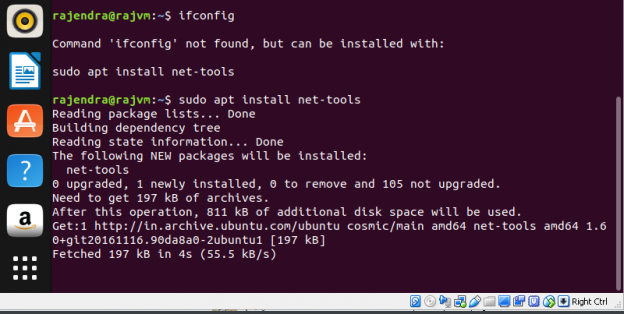 In Ubuntu, we can check the IP address using the ‘ifconfig’ command. But as you can see here, it shows an error that command ‘ifconfig’ not found. By default, it is not installed on Ubuntu so we need to install net tools to use this command. We will connect the virtual machine from outside to perform the installation. To do so, we need to configure the network at the VM level. Right click on the VM, go to Settings and then click on the Network. As you see above by default, the network adapter is ‘NAT’. The virtual machine does not contain any IP address in ‘NAT’ configuration, therefore, you cannot connect externally to this virtual machine. Modify this to ‘Bridged Adapter’ from the drop-down list. In bridged networking, we connect a virtual machine by the network adapter on the host system. Therefore, when you configure to ‘Bridged Adapter’ you can see the host network name as shown here. Click OK to save this setting. This takes little time to get the setting effective. Now, we can run the ‘ifconfig’ command and check the IP address. Alternatively, we can also run the command ‘IP addr show’ to check the IP address. You can see the IP address from the screenshot ‘192.168.225.25’. Provide the input as ‘Y’ and press ‘Enter’ to proceed. Apt-get update: This command will download the package list and update them from the repository. Run the command in the terminal on Ubuntu with sudo access. Install Putty: We will use this tool to connect the VM and run the queries. You can install PuTTY (SSH and Telnet client) in the Windows Server outside the VM. Installation is quite simple – launch the setup and follow the installation wizard. After installation, launch the ‘PuTTY ‘outside the VM and enter the IP address ‘192.168.225.25’ as shown here and press ‘Enter’. Click on ‘Yes’ to add server host key in the ‘PuTTY’ cache. If we click on ‘Yes’ it does not ask this again if we reconnect to the VM. Else, click on ‘No’ to connect without adding the key to the cache. Provide the username and password to authenticate. If we provide wrong information, we get error message ‘Access denied’. Install curl utility: curl utility in Linux is used to transfer file using different supported protocols. We can test the docker container using the ‘hello-world’ which verifies that the Docker is working fine or not. As you see that, it shows the message ‘ This message shows that your installation appears to be working correctly’. At this stage, we are ready to install SQL Server 2019 CTP 2.1 on Ubuntu. Let us connect using the Azure Data Studio from outside the virtual machine. In Azure Data Studio, provide the connections details as shown here and connect. We will explore more on SQL Server 2019 features using this docker container in my further articles. If we do not want our docker container, then we can drop it with simple steps. We can see now the container is removed quickly. Note: If we remove a container, it also deletes all the databases and all data in that particular container, so you should take a note of this before removing the container. You can take backup of your data if required for future use. In this article, we explored pre-requisite for installation of SQL Server using the Docker containers in Ubuntu. We also learned to install SQL Server with Docker container and connect to it using Azure Data Studio externally. In the next article, we will take a look over the tools which we can use to connect to SQL Server.